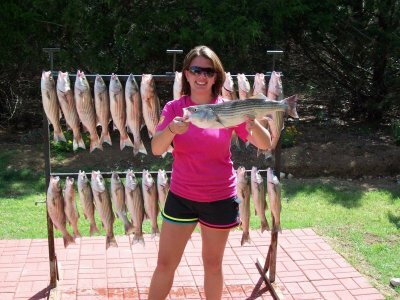 Summer has hit Lake Texoma. The July temperatures make for some HOT striper fishing. As of the last week of June, I have changed from fishing mainly live bait to topwater and slabs. I have found that most of the stripers working the top are on the small side, but you can catch a ton of them and catch an occasional good sized keeper. As the suns comes up later in the morning, I am off looking at the ledges and bluffs for the slab run. Once you find the fish the action is Hot and Heavy for a while then they move and so must you. 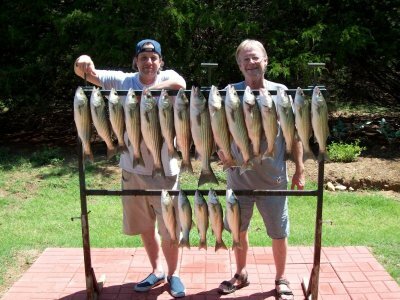 The fish you catch during these runs however are good sized, alot of over 20 inch fish, and along with the hard hitting slab action makes for a fun morning of Lake Texoma striper fishing. Alot of these Hot Summer Days we have come in short of our limit. The reason being is that we are catching too many of the over 20 inch fish. If you like lure fishing, now is an excellent time to give it a try. Chug Bugs and Cojo Minnows are my choice for topwater action. Mu choice for slab fishing is the TNT 180 1 1/2 ounce model made by Trolling Nolans Tackle Co. My second choice is the Loren 1 1/2 ounce slab. As for color selection, chartreuse and white seems to be the ticket. Once you find the fish, the best way to present the slab is burn and pause fishing technique. Drop your slab to the bottom and crank 5-7 times as fast as you can, do a quick pause and repeat. The stripers are chasing and the hitting it hard on the pause, so be ready. Another technique that is working very good is to once again drop the slab to the bottom and reel it in as fast as you can. When you think you are cranking fast enough, crank a little faster. The bite is a reaction or reflex bite and their is no need to try and finesse it, just crank and hold on. We are seeing a tremendous amount of boat traffic on Lake Texoma, so be very careful and courteous to your fellow boaters. Be sure to check all your equipment before you leave home. Check your batteries, make sure your horn is working, get a loud whistle, check your fire extinguisher and be sure your life jackets are in good shape and very easily accessible. Remember safety is the number one objective while you are out on Lake Texoma. 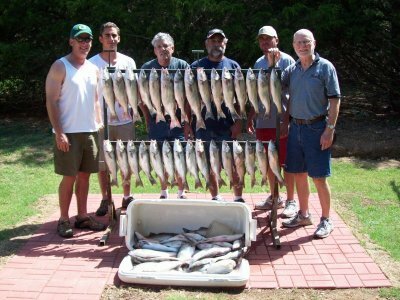 Come on out and enjoy a day on beautiful Lake Texoma.